Objective Inflammatory markers are elevated in insulin resistance (IR) and diabetes. We tested whether serum orosomucoid (ORM) is associated with postload glucose, β-cell dysfunction and IR inferred from plasma insulin kinetics during a 75 g oral glucose tolerance test (OGTT). Research design and methods 75 g OGTTs were performed with multiple postload glucose and insulin measurements over a 30–120 min period in 168 non-obese Japanese women (aged 18–24 years). OGTT responses, serum adiponectin and high-sensitivity C reactive protein (hsCRP) were cross-sectionally analyzed by analysis of variance and then Bonferroni’s multiple comparison procedure. Stepwise multivariate linear regression analyses were used to identify most important determinants of ORM. Results Of 168 women, 161 had normal glucose tolerance. Postload glucose levels and the area under the glucose curve (AUCg) increased in a stepwise fashion from the first through the third ORM tertile. In contrast, there was no or modest, if any, association with fat mass index, trunk/leg fat ratio, adiponectin, hsCRP, postload insulinemia, the Matsuda index and homeostasis model assessment IR. In multivariable models, which incorporated the insulinogenic index, the Matsuda index and HOMA-IR, 30 min glucose (standardized β: 0.517) and AUCg (standardized β: 0.495) explained 92.8% of ORM variations. Conclusions Elevated circulating orosomucoid was associated with elevated 30 min glucose and glucose excursion in non-obese young Japanese women independently of adiposity, IR, insulin secretion, adiponectin and other investigated markers of inflammation. Although further research is needed, these results may suggest a clue to identify novel pathways that may have utility in monitoring dysglycemia within normal glucose tolerance. Postload glucose and glucose excursion during an oral glucose tolerance test are related to insulin resistance and/or impaired insulin secretion, both of which are associated with obesity. Postload glucose and glucose excursion during an oral glucose tolerance test are related to serum orosomucoid in non-obese young Japanese women. The relationships are independent of fat mass and distribution, markers of insulin resistance/sensitivity, insulin secretion, adiponectin and other investigated markers of inflammation. Since insulin resistance and impaired insulin secretion are known to be causative in the development of diabetes, this might suggest that orosomucoid could be related to the glucose levels. These results may suggest a clue to identify novel pathways that may have utility in monitoring glucose dysmetabolism within normal glucose tolerance, although further research is needed. Subjects with impaired glucose tolerance (IGT) or impaired fasting glucose (IFG) have an increased risk for type 2 diabetes.1–3 Although more than half of the subjects who develop type 2 diabetes have IGT or IFG at baseline,4 prospective epidemiological studies have demonstrated that about 40% of subjects have normal glucose tolerance (NGT) at baseline.1 3 5 Therefore, other than fasting and 2-hour postload glucose, additional information might help us identify a group of subjects who might benefit from early lifestyle intervention. Inflammation is recognized as a major etiological determinant of multiple disease states including cardiovascular disease, type 2 diabetes and metabolic syndrome.6 Several prospective studies have shown that high baseline levels of C reactive protein (CRP) are associated with the increased risk for type 2 diabetes.7 8 Among inflammatory markers, orosomucoid (ORM) has been less studied in relation to metabolic disorders, although the acute phase reactant protein is one of the most abundant plasma proteins, accounting for about 1% of all plasma proteins.9 In addition, most of the studies described above were conducted in Western countries where the prevalence of obesity is high. Recently, Qin et al 10 have demonstrated that ORM activates AMP-activated protein kinase (AMPK) in skeletal muscle, which led to the activation of glycogen synthase and subsequent glycogen storage. As AMPK is important for glucose uptake and glycogen storage in the myocytes11 and skeletal muscle is responsible for the majority of glucose disposal,12 we aimed to examine whether ORM is associated with postchallenge glycemia in non-obese Japanese women and whether these associations, if any, depend on fat mass and distribution, insulin resistance (IR) and insulin secretion. We cross-sectionally studied 168 young women (50 collegiate athletes and 118 untrained students of the Mukogawa Women’s University), aged 18–24 years whose details have been reported elsewhere.13 14 Athletes were students of the Department of Health and Sports Sciences and were also members of volleyball club, basketball club or track club (middle-distance runners) of the University. They had been training regularly for 2 years or longer prior to the study, 5 hours a day and 6 days a week and participated regularly in competitive events in their respective sport specialties. Non-athletes were students of the Department of Food Sciences and Nutrition. Although they were not engaged in any regular sport activity, they had 9367±1971 steps/day (mean±SD of 77 non-athletes, who used a pedometer for 14 days and mean steps a day were calculated in each participants). This may explain in part the result that the difference in insulin sensitivity was small between athletes and non-athletes as previously reported.13 Subjects with clinically diagnosed acute or chronic inflammatory diseases, endocrine, cardiovascular, hepatic, renal diseases, hormonal contraception and unusual dietary habits were excluded. Nobody reported to receive any medications or have regular supplements. The study was in accordance with the Helsinki Declaration. All subjects were recruited as volunteers and gave written consent after the experimental procedure had been explained. Leptin, adiponectin, high-sensitivity CRP (hsCRP) and plasminogen activator inhibitor-1 (PAI-1) were measured in fasted samples as previously reported.13 14 ORM concentrations were measured in fasted samples by an immunoturbidimetric method using a commercially available kit (N Antiserum to Human α1-acid Glycoprotein, Siemens Healthcare Diagnostics, Tokyo, Japan) and an autoanalyzer (JCA-BM6010, JEOL, Tokyo, Japan). Intra-assay and interassay CV at 87 mg/dL was 1.4% and 1.7%, respectively. Data were presented as mean±SD unless otherwise stated. Due to deviation from normal distribution, IGI and hsCRP were logarithmically transformed for analyses. Cross-sectional differences were tested using analysis of variance among ORM tertile and then Bonferroni’s multiple comparison procedure. Associations of ORM were analyzed by Pearson’s correlation. In order to identify most important determinants of ORM, stepwise multivariate linear regression analyses were performed. Independent variables included were all variables that showed significant difference among ORM tertile. Comparisons of ORM levels between athletes and non-athletes were made with t-test. A two-tailed value of p<0.05 was considered significant. Statistics were performed with SPSS system V.17.0 (SPSS, Chicago, Illinois, USA). Of 168 women studied, 2 athletes and 1 non-athlete had IFG, 4 non-athletes had IGT and 161 had NGT. Because serum ORM levels did not differ between athletes and non-athletes (126±28 vs 127±26 mg/dL, p=0.87), both groups were combined to be analyzed to obtain wider range of adiposity. Table 1 displays characteristics of women grouped by ORM tertile (<112, 113–134, ≥135 µg/mL). As previously reported,13 14 young women were normal weight, had normal waist circumference and hence were insulin sensitive as indicated by normal fasting insulin levels. ORM levels were not associated with FMI, the percentage of body fat, trunk/leg fat ratio and serum leptin (table 1). In addition, ORM was not associated with serum hsCRP and PAI-1. Furthermore, no difference was found in serum adiponectin among three groups as well. In contrast, as ORM increased from the first through the third tertile (figure 1), postload glucose levels at 3 points of time increased in a stepwise fashion in both non-athletes and athletes, whereas postload insulin levels did not differ except for 1 hour insulin (table 1). 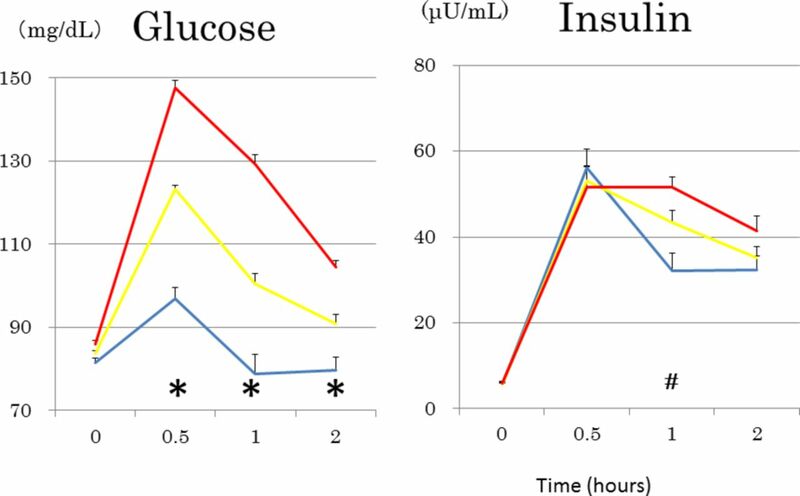 AUCg and an incremental 30 min glucose concentration increased in a stepwise fashion, whereas an incremental 30 min insulin concentration did not differ (table 1). Women with the third (higher ORM) as compared with the first ORM tertile had lower IGI and the Matsuda index, and higher fasting glucose, 1 hour insulin and AUCi. HOMA-IR and the percentage of athletes did not differ. Mean±SEs of glucose curves during 75 g oral glucose testing in young Japanese women divided into three groups according to tertile of serum orosomucoid: low, blue; median, yellow; high, red. *Under blue lines; glucose values at this time points are significantly different from each other among three tertile groups at p<0.05 or less. #Insulin values at 1 hour were significantly lower in the low as compared with the median and the high orosomucoid tertile. n=56 in each tertile. Range of orosomucoid (in mg/dL); low: <112, median: 113–134, high: ≥135. Multivariate stepwise linear regression analyses for ORM as a dependent variable was done, which included postload glucose values at 3 points of time, AUCg, IGI (log transformed), the Matsuda index and HOMA-IR as independent variables (table 2). AUCg and 30 min glucose were independent determinants of ORM and explained 92.8% of variations of ORM. Subgroup analyses in athletes and non-athletes revealed similar results (table 2). Figure 2 shows the scatter plot between serum ORM and 30 min glucose and AUCg. The scatter plot between serum orosomucoid and 30 min glucose and the area under the glucose curve (glucose-AUC) during a 75 g oral glucose tolerance test. Metabolomics now seeks to identify early biomarkers which are predictive of the development of dysglycemia and type 2 diabetes. A Finnish metabolic profiling study22 demonstrated that branched-chain and aromatic amino acids and orosomucoid referred to as α1-acid glycoprotein, were predictors of both fasting and 2-hour glucose at 6.5-year follow-up in a general population setting of middle-aged men and women. In above-mentioned studies,19–22 serum ORM concentrations were considered a marker of low-grade chronic inflammation, which links obesity to IR and β-cell failure resulting in dysglycemia.26 However, in the present study, there was no association of ORM with FMI, trunk/leg fat ratio, hsCRP and adiponectin, the last of which is known to stimulate glucose uptake through AMPK or peroxisome proliferator-activated receptor α activation.27 Since IR and β-cell failure are known to be causative in the development of diabetes, this might suggest that ORM could be related to the glucose levels independently of the muscle insulin signaling: insulin-independent glucose uptake via skeletal muscle. Increased ORM may be a consequence of increased plasma glucose in the present study as it is reported that adipose ORM levels were elevated by high glucose31 and it has been suggested to modulate immune responses to protect adipose tissue from inflammation and metabolic dysfunction.21 However, this explanation appears to be unlikely in the present study because differentiated adipocytes were incubated with extremely high glucose (450 mg/dL)31 and because another study reported repressed adipose ORM expression in diabetic ob/ob mice, although ORM was expressed in adipose tissue at high levels.32 The biology underlying the association between high serum ORM concentrations and increased glucose excursion found in the present study is not known. The strengths of the present study include homogeneous study population with scarce confounding factors, and accurate and reliable measures of body composition by dual-energy X-ray absorptiometry (DXA). Several limitations of this study warrant consideration. The cross-sectional design of the present study complicates the drawing of causal inferences, and a single measurement of biochemical variables may be susceptible to short-term variation, which would bias the results towards the null. We used crude measures of insulin sensitivity/IR and insulin secretion, which may be less accurate. Statistical power was not calculated. As we studied young Japanese women only, results may not be generalized to other gender, age populations, races or ethnicities. In conclusion, elevated circulating orosomucoid was associated with elevated 30 min glucose and glucose excursion in non-obese young Japanese women independently of general and abdominal adiposity, insulin secretion, insulin sensitivity/resistance, other investigated markers of inflammation and adiponectin. Further research is needed to determine the public health and clinical significance of these results. But these results may suggest a clue to identify novel pathways that may have utility in monitoring glucose dysmetabolism within NGT. The authors would like to thank all participants for their dedicated and conscientious collaboration.
. Impaired glucose tolerance and impaired fasting glycaemia: the current status on definition and intervention. Diabet Med 2002;19:708–23.
. Inflammatory markers and risk of developing type 2 diabetes in women. Diabetes 2004;53:693–700.
. Evidence for 5' AMP-activated protein kinase mediation of the effect of muscle contraction on glucose transport. Diabetes 1998;47:1369–73. Contributors AT, SM, MY, MT, KK, MK, GY and BW collected and analyzed data. TK wrote the manuscript and KF reviewed and edited it. All authors approved the final version of the manuscript to be published. TK supervised the study, had full access to all the data in the study and takes responsibility for the integrity of the data and the accuracy of the data analysis. Ethics approval The Ethics Committees of the Mukogawa Women’s University (No. 07-28). Data sharing statement The ethics committees of the University does not allow us to open data except for a manuscript.